We welcome James Nadiope and his colleagues who have established Fort Portal as an International City of Peace. Their organization is a sustainable travel bureau that promotes a culture of peace through socially responsible economic development. 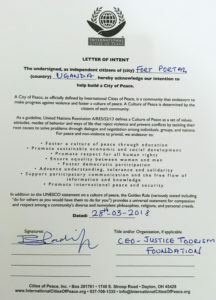 The Justice Tourism Foundation is a registered grassroots tourism Not for Profit Organization (NPO) in Uganda which seeks to promote tourism that is ethical, fair, positive and authentic experiential educational and alternative, sustainable and socially responsible travel as a way to connect tourists with local communities while promoting the local economy and wellbeing of host communities in Uganda. Established in 2017, the Justice Tourism Foundation (JFT) operates according to the tenets of “justice tourism”, that is, tourism that holds as its central goals the creation of economic opportunities for the local community, positive cultural exchange between host and guest through one-on-one interaction, the protection of the environment and encourage the conservation of cultural and natural heritage. • Provide ethical, engaging, and creative travel experiences that facilitate genuine cross-cultural connection and learning opportunities, inspiring compassion towards fellow human beings. 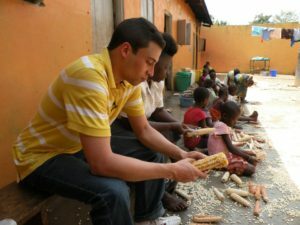 • Utilize responsible travel to promote and support grass-roots community projects and benefit host communities. Our mandate represent an integrated approach to Ethical and fairly traded tourism practices focused on the development of economic, social, natural, human, and cultural capital in order to sustain village life and culture, improve livelihoods, empowers rural women and youth with skills training and connect available related tourism business opportunities, and enables them to earn an income to transform their communities in remote rural areas and reduce the need for outward migration. 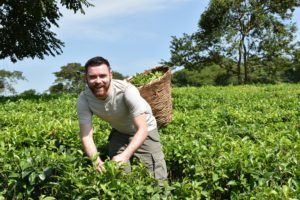 As an organization that represents ethical and fair traded tourism practice, it is our role and our interest to promote ethical, authentic, and transparently marketed volunteer experiences. 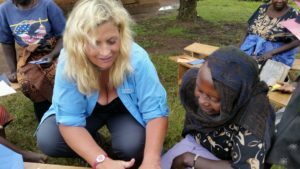 JTF works closely with local communities in Uganda to develop and manage sustainable and empowering initiatives through our volunteer placement program. In the process, we create strong cross-cultural bonds and new global citizens. Our volunteer Programs offer the opportunity to participants to engage in an authentic immersion experiences with community members and support projects created and led by the community. The project serves as a vehicle to greater cultural understanding, cross-cultural friendships and ultimately towards increased global cooperation. 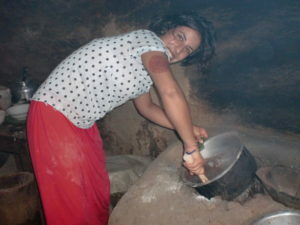 We have strong responsible tourism values, and believe that travel should always benefit the local community and as a result most of our tours directly finance grass-root development projects initiatives in rural Uganda, providing sustainable clean water for rural communities, education, Primary health Care and women and youth empowerment projects for disadvantaged women and young people. As a preferred ecotourism destination, Justice Tourism Foundation has undertaken the task of creating an ethical and fair traded tourism business in Uganda which highlights the best of what Uganda has to offer while ensuring the country heritage and environment are preserved for this and future generations. Ecotourism has many definitions and this is one of the shorter ones, “responsible travel to natural areas that conserves the environment and sustains the well-being of local people”. 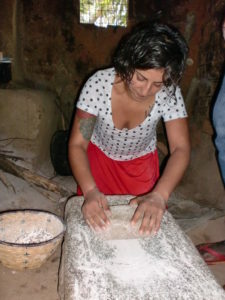 We therefore craft alternative tour trips which are designed to connect travelers with local people and places for an authentic educational experience. We craft ethical, educational travel experiences, with the belief that travel can enrich the lives of individuals, communities, and the world. All our tours have an element of learning, with a philosophy that travel is as much about learning from new cultures and places, as it is about a life-long learning experience for personal development. We aim for culturally immersive and inspirational holidays that connect individuals and communities across the East African Region, to help people to realize that we are not that different, and to leave a positive impact on everyone we meet and every destination we visit. By choosing the ethical and fair traded tourism practice, travelers are directly contributing to the livelihoods of everyone involved in their trip, from the staff who work for the establishments they stay at, the communities they support and the suppliers who provide them with services. 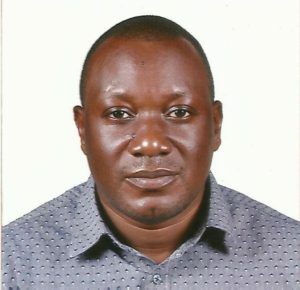 James Nadiope was born in Jinja in Eastern Uganda. At top of his class and a high school student leader, his life was poised to be a remarkable success until 1982. After the death of his father, James was left as an orphan and could not continue at that time with his schooling. Plunged into the world of a vagabond, James would become a jack of all trades to survive. He has been a porter, house boy, a church minister, motivational speaker, tourism consultant and a social worker as an advocate for the children’s rights through his the African Child Foundation an organization his founded in 1998 to provide education to orphans and street children. The horrific lose of his father in 1982 would not break James’s childhood ambition to succeed. 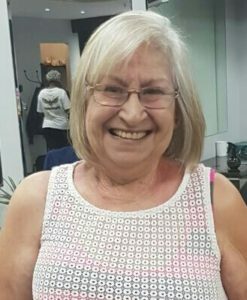 In 2005 he established International Volunteers Network to provide volunteer tourists opportunities to interact with rural people and experience cultures. His business acumen enabled him to rise to the top of the tourism industry between 2005 and 2014. 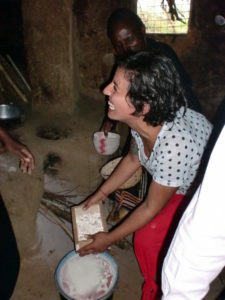 In 2014, James founded the Africa Sustainable Tourism Care Foundation as a tourism NGO to promote conservation of biodiversity and development of rural Uganda communities in high tourism potential areas to supplement household incomes through a diverse and holistic, innovative, sustainable tourism and other environmental sustainable businesses to alleviate poverty, fight gender inequality, empower local communities, and in particular disadvantaged groups (women, youth, ethnic people), and encourage the conservation of cultural and natural heritage. With over a decade of experience as a social entrepreneur leader , James is currently both the CEO of the Africa Sustainable Tourism Care Foundation and advises Africa Sustainable Tourism Care Foundation on issues of strategy and sustainability and the CEO and Ethical Travel Consultant with Justice Tourism Foundation and he consults on responsible tourism. James is passionate about developing tourism creatively and responsibly to ensure economic and social benefits for local people, communities, workers and businesses through unique and authentic visitor experiences. He strongly advocates that sustainability is no longer a luxury but an imperative in order to leave a world that is livable for our children. James’s goal is to make tourism the most sustainable industry on the planet – improving economies and creating wealth, enriching our cultural experience and helping us to understand and appreciate our environment. 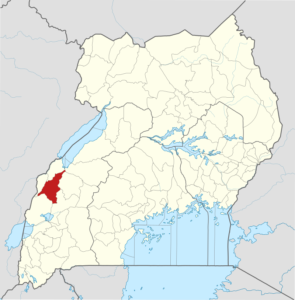 Fort Portal is located about 180 kilometres (110 mi), north-west of Mbarara, the largest city in the Western Region. This is approximately 297 kilometres (185 mi) by road, west of Kampala, Uganda’s capital and largest city, on an all-tarmac two-lane highway. According to the 2002 national census, the population of Fort Portal was about 41,000. 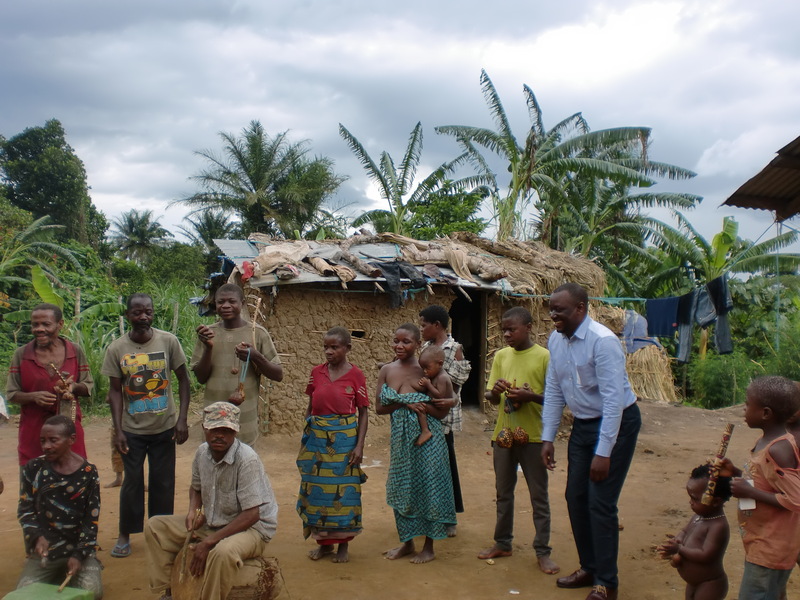 In 2010, the Uganda Bureau of Statistics (UBOS) estimated the population at 46,300. In 2011, UBOS estimated the population at 47,100. In August 2014, the national population census put the population at 54,275. Fort Portal is home to three hospitals. Fort Portal Regional Referral Hospital, a 300-bed public hospital administered by the Uganda Ministry of Health is the largest. The next-largest is Holy Family Virika Hospital, a private hospital with a bed capacity of 155, owned by the Roman Catholic Diocese of Fort Portal. The smallest of the hospitals is the 100-bed Kabarole Missionary Hospital, community hospital administered by the Church of Uganda, originally founded by John Edward Church of the Church Mission Society. The town houses two institutions of higher learning. The main campus of Mountains of the Moon University, a private university, is located in the center of town. Also located within the town, is the main campus of Uganda Pentecostal University, a private university affiliated with the Pentecostal Movement. St. Mary’s Minor Seminary, a Catholic secondary school for prospective Catholic priests is also located in Fort Portal.